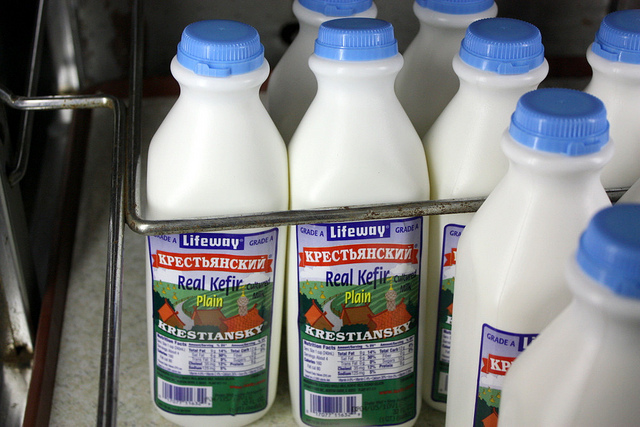 Kefir is a cultured-milk beverage believed to have originated many centuries ago in the Northern Caucasus Mountains. Kefir has a uniform creamy consistency, a slightly sour taste somewhere between buttermilk and sour cream, and a mild yeasty aroma. Kefir may have small amounts of carbonation and alcohol. It can be enjoyed plain or sweetened to taste. Traditional kefir is prepared by combining fresh milk with the Kefir culture made up of yeasts and lactic acid bacteria. Kefir’s live culture has been claimed to have health benefits similar to that of yogurt. Kefir could be made in a retail-foodservice operation as a fermented (acidified) food with a simple HACCP plan (approved by the regulatory authority). The kefir culture is more commonly referred to as “grains” since it forms grain-like casein-polysaccharide-microorganism particles during fermentation. The exact combination of bacteria and yeasts vary between kefir cultures, and might include: Lactococcus lactis subsp. lactis, Lactococcus lactis subsp. Cremoris, Lactococcus lactis subsp. Diacetylactis, Leuconostoc mesenteroides subsp. Cremoris, Lactobacillus kefyr, Klyveromyces marxianus var. Marxianus, and Saccharomyces unisporus. To ensure consistency and sterility, commercial producers now generally use a powdered starter culture rather than grains. However, such cultures may not form grains or continue to culture indefinitely; making kefir grains the preferred choice for individuals. Retail-foodservice operators could use either. Commercial production starts with whole, low-fat or skim milk, adjusted for body with nonfat milk solids. The milk is pasteurized, and then heat-treated at 203°F for 10 to 15 minutes denaturing whey proteins. For unpasteurized milk the pasteurization step would be considered a CCP (critical limit 145°F for 30 minutes or 161°F immediately). For pasteurized milk the critical limit is 145°F for 15 seconds. If whey proteins are not denatured they can cause a gritty product. The heat treated milk is then cooled to 64.4 to 71.6°F, 2% to 5% kefir grains or culture are added, and the mixture is incubated at 64.4 to 71.6°F for 24 hours. After that time the pH ≤ 5.0 (CCP) and the kefir grains are sieved out and the product is pasteurized, packaged, and maintained chilled (SOP ≤ 41°F) . The final kefir product can be flavored in a manner similar to yogurt, but the flavoring cannot raise the pH > 5.0. The addition of an active culture of kefir grains would be considered an SOP under the HACCP food safety system. As kefir ferments the pH will continue to drop from 5 to 4. At approximately pH 4.5 the kefir will begin to set. Therefore, drinkable kefir should be pH 4.5 – 5 and kefir cheese would be 4-4.5 pH. Home fermentation of kefir was traditionally a mechanism to preserve milk before the advent of refrigeration. Fermented foods are generally considered to be less likely to cause foodborne illness due to the fermentation process. The competitive activity and metabolites of the culture help to – partially or completely — kill or inhibit the growth of illness-causing microorganisms. Today however, the preservation of milk is easily accomplished using pasteurization and refrigeration, leaving kefir to be enjoyed for its flavor. Kefir is generally considered to be safe due to the lack of evidence of foodborne illness events related to it. Properly fermented kefir (pH less than 4.5) inhibits many pathogens, but not for Escherichia coli, Listeria monocytogenes, Salmonella spp., and Yersinia enterocolitica. These pathogens may grow very slowly or just survive. Care therefore must be taken in the fermentation of kefir to prevent the access or growth of these microorganisms after the pasteurization or heating steps. Use only pasteurized milk or pasteurize as part of the process (CCP). Use quality kefir grains from a reputable source (SOP). Because of the small risk of pathogen growth in fermented kefir, it is NOT recommended for those with weakened immune systems, e.g. pregnant women, the elderly, the very young and the chronically ill (Policy: e.g. don’t market the kefir as a health drink to cure something). Pasteurization of kefir before consumption is recommended and will kill any potential pathogenic microorganisms listed above (optional). Refrigeration is required after fermentation (≤ 41°F). Pasteurizing kefir can be accomplished by heating the kefir, after the grains have been filtered off, to 161°F for 15 seconds. Place the open jars of kefir in a hot water bath. Stir the kefir while heating until a temperature of 161°F is reached, using a quality food thermometer. Hold at this temperature, making sure the temperature does not drop below 161°F for at least 15 seconds, and then remove the jars from the bath. Cool them quickly in a cool water bath. Promptly refrigerate the kefir ≤ 41°F; it may be stored for 7-10 days. Pasteurized kefir will not have the probiotic effects of a live culture, but will be safer, especially for those with weakened immune systems. Heller, KJ. 2001. Probiotic bacteria in fermented foods: product characteristics and starter organisms. American Journal of Clinical Nutrition (73)2:374S-379s. Gulmez, M and A Guven. 2003. Survival of Escherichia coli O157:H7, Listeria monocytogenes 4b and Yersinia enterocolitica O3 in different yogurt and kefir combinations as prefermentation contaminants. Journal of Applied Microbiology 95:631-636. Dom’s Kefir-making in-site Website: http://users.chariot.net.au/~dna/Makekefir.html (Accessed 15 Nov 2004).